«And it shall come to pass in that day that the remnant of Israel, and such as are escaped of the house of Jacob, shall no more again stay upon him that smote them; but shall stay upon the LORD, the Holy One of Israel, in truth…. The remnant shall return, even the remnant of Jacob, unto the mighty God. For though thy people Israel be as the sand of the sea, yet a remnant of them shall return» ( Isa.10:17-25). «And this shall be the plague wherewith the LORD will smite all the people that have fought against Jerusalem; Their flesh shall consume away while they stand upon their feet, and their eyes shall consume away in their holes, and their tongue shall consume away in their mouth» (Zech.14:12) (a hydrogen bomb?). «But in those days, after that tribulation, the sun shall be darkened, and the moon shall not give her light, and the stars of heaven shall fall, and the powers that are in heaven shall be shaken. And then shall they see the Son of man coming in the clouds with great power and glory» (Mark.13:24, Mat.24:15, Luke.21:20). As you remember, from the occupation of Jerusalem to the end of the Antichrist's power there are 1290 days (Dan.12:11). These are 1290 days until the 7th trumpet. After the 7th trumpet Antichrist will lose his authority above the righteous. «Blessed is he that waiteth, and cometh to the 1335 days» (Dan.12:12). After the 7th trumpet there are 45 (1335-1290=45) days of Apocalypse - the reaping, which will begin after the carrying of the first righteous men (144000, 2 prophets, the elected church -Rev.3:10) away to heaven. «Thy dead men shall live; together with my dead body shall they arise! Come, my people, enter thou into thy chambers, and shut thy doors about thee: hide thyself as it were for a little moment, until the indignation be overpast. For, behold, the LORD cometh out of his place to punish the inhabitants of the earth for their iniquity: the earth also shall disclose her blood, and shall no more cover her slain» (Isa.26:19-21). These 45 days will be very hard, all the unrighteous all along the Earth will be destroyed, but no righteous man will suffer. On the 45th day Christ Himself will descend to Earth. 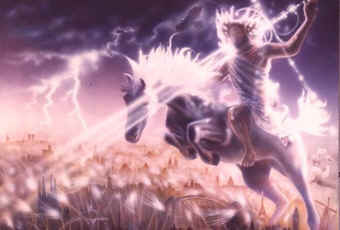 «And at that time shall Michael stand up, the great prince who standeth for the children of thy people: and there shall be a time of trouble, such as never was since there was a nation even to that same time: and at that time thy people shall be delivered, every one that shall be found written in the book. And many of them that sleep in the dust of the earth shall awake...» (Dan.12:1, 2). «In that day the LORD with his sore and great and strong sword shall punish leviathan the piercing serpent, even leviathan that crooked serpent; and he shall slay the dragon that is in the sea» (Isa.27:1),i.e. humanoid "aliens" and various kind of devil reptoids.